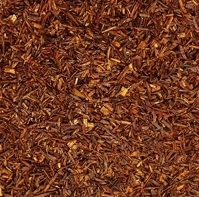 Rooibos "red tea" (pronounced Roy-boss) is not from the Camellia Sinensis tea plant as are all true teas, and is generally considered a tisane, or herbal tea. Rooibos is processed from the leaf of the Aspalathus linearis shrub native to South Africa and while the liquor looks and tastes very much like tea, this "tea" is 100% caffeine free. It is found to be rich in vital minerals, Vitamin C and is very high in anti-oxidants (more so than most other beverages available), high in flavonoids, low in harmful alkaloids and low in tannins. It contains a high level of SOD, an agent that fights free radicals. It has been touted as being useful in many health related conditions and for promoting general well being. Rooibos can be enjoyed hot or cold, with milk or alternative creamers, lemon, agave nectar or honey. Rooibos*, Chamomile*, Lavender*, & Kanna.